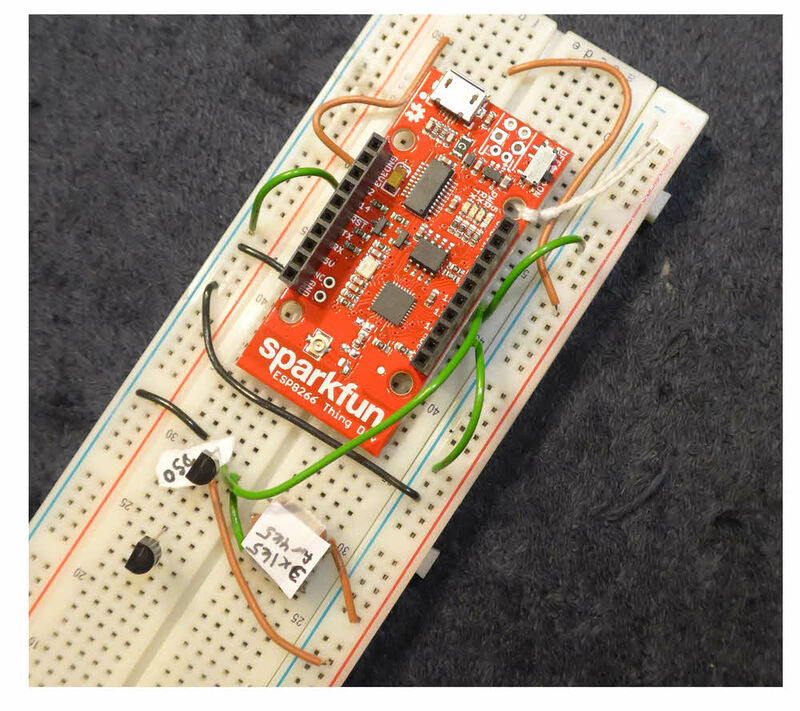 The Sparkfun ESP8266 "Thing" (link to Sparkfun product description) has been around for a while now. It is just one of many ways to enjoy the ESP8266 chip. I was wrong to be so cynical, and lazy and not give it a try before I did... in December 2016. But "an Arduino" with everything you need to connect via WiFi "built in". For $16 (12/16). And it will run off of 2 AA cells, or LiPo power. Just before I go into why I like it so much, let me mention that I've written a separate page to cover the topic of the Thing's analog input pin ("ADC"). A little "aside" before I proceed: It must be said that Sparkfun is rarely the cheapest source for anything. But in most cases, I find the premium very modest, especially when you consider the advantages of dealing with Sparkfun. In the case of ESP8266 based systems, it is true that the Sparkfun product is "expensive"... $16! Oh dear!... and it isn't the most powerful ESP8266 out there. Humor me. Start with the device listed here. It works!. You may want to use the Sparkfun documentation. Once you are no longer an ESP8266 newbie, if you want to play with eBay wonders, fine! By then, you'll be in a better position to decide between "Faulty module" and "Programming Error". The ESP8266 is "good" and "bad". "Good" in that it opens the way for some amazing projects. "Bad" in that the best of those will involve multiple technologies... "Arduino" (type) programming, Wifi, html, etc. So maybe if you are learning "everything" at once, it won't all be "easy"... but even if you are new to some of the several threads to this story, the Thing is a good place to start. And if you "don't make it" (for now), it will only cost you $16! 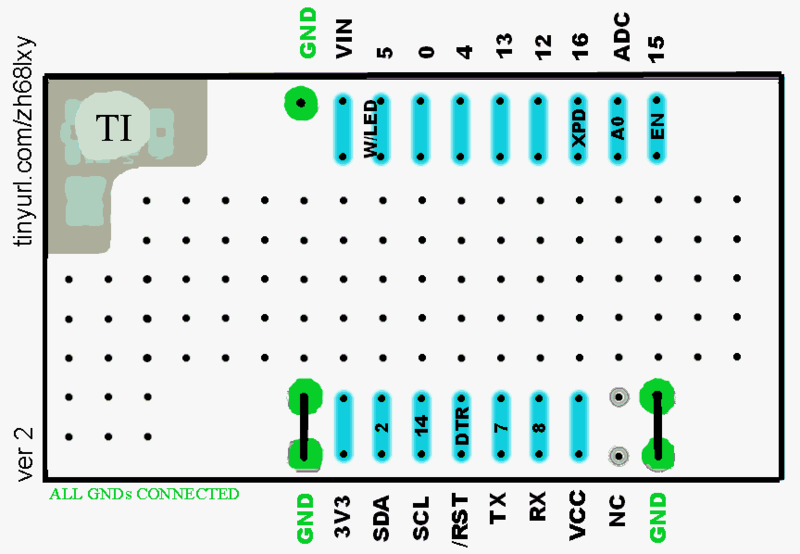 When I first tried to connect an Arduino to a LAN, by a mere "wired" connection, the cost of entry was a lot higher. Setting up, using a device in a LAN context will never be "simple", even a wired device, let along something WiFi. But I can't imagine it being easier than the ESP8266 "Thing" makes it. Be sure to try changing the upload speed used to program the board. You do this with the IDE's Tools/ Upload Speed item. It "works" at the default speed, but you soon begin to seethe while the upload progresses. Set the speed too high, and you'll get the occasional failed upload. No big deal... just invoke "upload" again. I've been uploading at 512,000 without getting failed uploads. 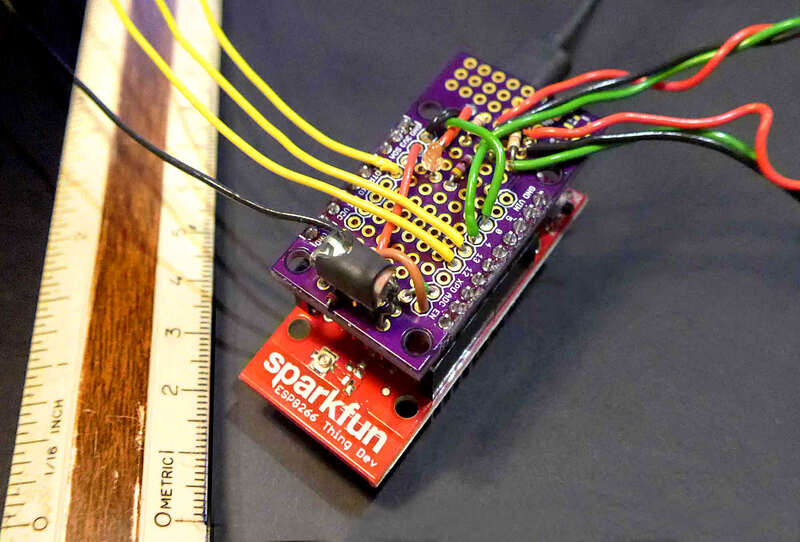 The Sparkfun ESP8266 runs at EIGHTY megahertz. Be prepared to reconsider what you consider "normal" for execution speed, if, like me, you come from EIGHT megahertz Arduino Pro Minis. You may find that you get "initHardware not declared within this scope" (or similar) when you go to make a minor change to something that was working just fine a moment ago. Try moving the code for your "setup()" and your "loop()" down to the bottom of you code, if you get something like the above. the excellent www.elec-cafe.com essay about using DS18B20 with ESP8266. .... to put a DS18B20 temperature sensor on my Thing. Went well. Working fine. These Dallas 1-Wire sensors are excellent. The temperature sensors seem to be the most widely used, but there are other devices... sensors and actuators... in the 1-Wire family. Yesterday (first day) I was working only a few meters from my WiFi base station. Today, I was glad to be alone in the building, as I felt a little foolish going from distant room to distant room with my Android in one hand, and the ESP8266 in the other, seeing if it would still serve pages, "distant" from the base station. The Android's signal strength meter was usually showing a very poor signal... but the Thing served pages from three different locations with never a fail. And I was only using the "baby" antenna etched into the tracks of the PCB. There is a connection for an external antenna if you want to extend the device's range. The sites were about 15m from the base station, sometimes between rooms on the same floor, sometimes between rooms AND floors. Sometimes very substantial masonry barriers... pierced by doorways... were in the way. As I say... my Samsung Android was struggling to see the signal, but it was adequate for the Thing. I prefer to put such things on a fixed IP address within the LAN. Easy! I'll explain in a moment. Also, unless you don't already have a web server on your LAN, you probably want to tell your Thing to serve on a different port. And now, I can return to the question of making the device use a specific IP address. The demo code, as supplied, asks the LAN's DHCP server to assign an IP Address.... AND, if you look at the information coming up via the Arduino's serial monitor, it (the Thing) tells you the address it has been assigned for this session. But as some will know, and others will learn, that really isn't a good solution for some situations. The "problems" are nothing to do with the Thing. They would arise with ANYTHING you wanted to put "on the internet". I go into them quite a bit in the Arduserver material. So... can the Thing be made to "sit" at a programmed IP address? Yes! Easily! A "crude" version would entail even less than you see here, but, with a nod to Good Programming Practice, the bits you need to change from program (or environment) to program/ environment, are being put up at the top where they are easy to find. The values are going into well named "variables". (I put that in quotes, because the value won't change in the course of the program running.) And then, when those values are needed, they are supplied by inserting the variable where the value is needed. The only value you are likely to want to change is the 240... but your LAN may be unconventional, and require other tweaks. That's it! Just get yourself a Dynamic DNS URL and take care of your router's NAT table, and your little $16 webserver can be seen by the world! -- 1) They are things you have to do to connect ANYTHING on your LAN for access by the wider world. -- 3) Once you've done it for one device, it is much easier to do again, for the next device. -- 4) It isn't Rocket Science. Anyway... have a lot of fun with the Thing INSIDE your LAN, you don't have to tackle those things. Get it working on the LAN first. Then set out to conquer the (internet) world. The illustration below shows two instances of essentially the same circuit... an ESP8266 with some bits and pieces (and software) making it an "Arduserver"... a "proof of concept" demonstrator for people interested in getting started with "Internet of Things" projects. Connect to the ESP8266 from anywhere on the internet, turn things on and off, see what sensors attached to the ESP8266 are "seeing". Both feature "counters"... not part of the basic Arduserver. Both report their data not just in human-friendly form, but also in machine-friendly form. You can use a program to monitor the values coming from the sensors, draw graphs, record data files, raise alarms if a parameter gets out of spec. It is a 'public project' at OSH Park. Costs only $10 for the minimum order of three. (p&p free to anywhere in the world, and service, at least US/UK is rapid.) I not only buy this sort of thing from OSH Park, but also have my own boards made by them. Very satisfactory. Here's a rough guide to what the board offers. The guide has not been extensively tested. Let me know, please if you spot mistakes. At the upper left, some pads for a power supply. I haven't investigated this, the "TI" is for "Terra Incognito". Pay attention:: There are 5 pads I've marked with a white blob with a black spot in the center. **They are all connected to one another**. And then there are the 16 pairs of pads which I've marked with short vertical cyan lines. The pads of each pair are connected to one another, but not, as far as I have seen connected to anything else. As far as I have seen, all of the other pads are singletons. I used one of these proto-shields to create my third ESP8266. (Feb 2017) It went very well. I even added some features. Robust, and doesn't tie up a breadboard, as so many of my "I'll finish that later" projects do, sigh. Some say that 512k is too little. I say I can have a lot of fun in 512k at $15. Of course, if Sparkfun can increase the memory, at about the same price, who's going to complain? Some say that even at $15 it is too much. I like doing business with someone I can go back to. I like supporting them because they bring me nice toys, with good documentation. I like being able to do a lot of shopping in one place, and know when my parcel will arrive. Do I buy everything there? No. There aren't many I/O pins. No, there aren't. And my Arduino Pro Mini doesn't have built in WiFi. 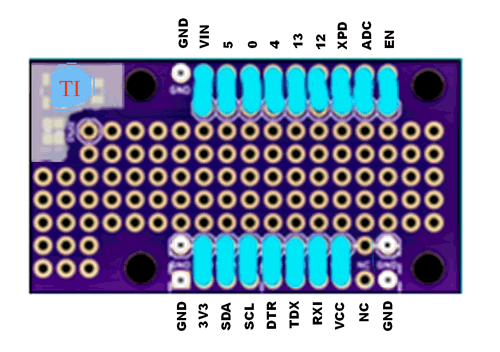 Minor detail: The ESP8266 provides you with an LED onboard. Already hooked up to one of the GPIO pins of the processor. Almost like the LED on D13 of a traditional Arduino. However, instead of being on D13, it is on D5. There are many easy ways to print from a web-page, if you haven't already discovered this. Right click on the image for starters, and after that what's easiest depends on your system's setup and wants. I just used "view image", and printed from the result of that without hassle. The designations of what signals are on each pad is a work in progress. The text in the silkscreen of the actual PCB, as purchased 1/17, doesn't exactly agree with the silkscreen on the Sparkfun ESP8266 "Thing", Dev Board. Purchased 12/16. BUT THIS ISN'T A BIG DEAL! When you've used Arduinos and the like for a while, you will come to see this as "routine". If you found this of interest, please mention in fora, give it a Facebook "like", Google "Plus", or whatever. I've almost given up writing these pages, because it seems they are seldom read, and of course not every reader will use them... so... is there any point? If you want more of this stuff, help!? Click here to visit my main homepage where you can explore other areas, such as education, programming, investing. Page tested for compliance with INDUSTRY (not MS-only) standards, using the free, publicly accessible validator at validator.w3.org. Mostly passes. A few "bad attributes" due to Google+ button, etc.